Create a vibrant, color-filled shade garden using shrubs of different shapes, sizes and colors. Shade-loving shrubs are equally as hardy and colorful as those that require full sun. Evergreen shrubs are an added bonus to the garden because they keep their foliage color all year long. Nestled among a shaded garden wall, they bring in versatility and brilliance to the space. Chapman’s rhododendron is an evergreen shrub that prefers full, high and bright shade to grow. These classic shrubs are grown for their showy flowers that have a puffball-like shape. 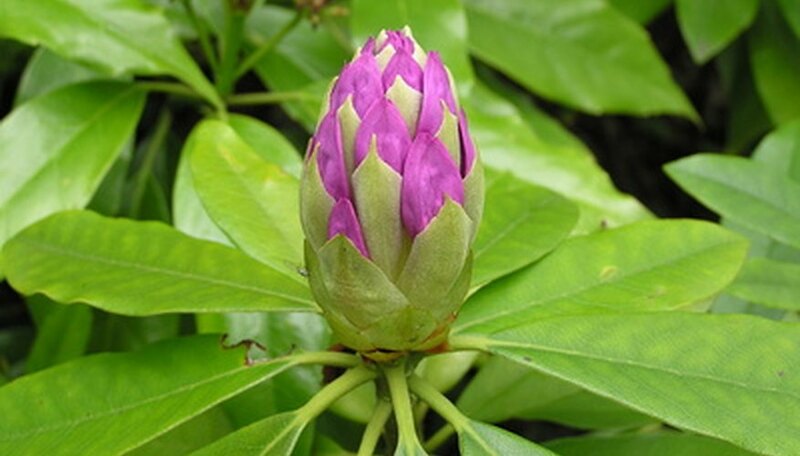 Chapman’s rhododendron is an open, loosely spreading shrub with medium green leaves. The lustrous leaves grow 1 to 2 inches long. The 4-inch flowers are pale pink and emerge in late spring to light up a shaded spot in the garden. Chapman’s rhododendron grows 4 to 8 feet tall and 6 to 8 feet wide and is heat tolerant. The plants require well-drained, moist soil that is humus-rich. The USDA hardiness zone for planting is 7 to 9. Alexandrian laurel is a slow-growing evergreen shrub with fine texture and an open form. Alexandrian laurel grows 2 to 3 feet tall and wide. The branches on the Alexandrian laurel are slender and arch up and away from the center of the shrub. The long-lasting lustrous foliage is a deep emerald green and ideal for floral arrangements. The leaves grow up to 4 inches long and are tapered on both ends and attached to green stems. In spring, small, yellow flowers emerge to light up the shrub. Fall brings to the shrub red-orange berries that contrast with the bright green leaves. Alexandrian laurel shrubs prefer full shade and moist, well-drained soil that is nutrient-laden. It is also a very versatile shrub and can tolerate clay and sandy soils. The USDA hardiness zone for planting is 7b to 9. The Japanese plum yew is a slow-growing evergreen shrub with medium to fine texture. The spreading form of the Japanese plum yew is rounded and wider than it is tall. The maximum height and width is 10 feet tall and 14 feet wide. Japanese plum yews have dark green leaves that are sharply tapered and arranged in spirals. The leaves grow 1 to 2 inches long and hold their color into winter, making for a striking addition to the landscape. These hardy shrubs are heat and drought tolerant. Japanese plum yews prefer full shade and moist, well-drained soils. The USDA hardiness zone for planting is 6 to 9.